^ Shanker, Thom (February 4, 2005). 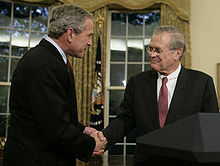 "Rumsfeld Says He Offered to Quit". The New York Times. Retrieved June 28, 2017. 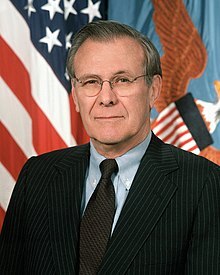 ^ "Known and Unknown - Donald Rumsfeld - Author Biography". Litlovers.com. Retrieved April 17, 2017. ^ a b "Air Force News". News from Afghanistan & Iraq. Air Force Times. Archived from the original on July 22, 2012. ^ "President Richard Nixon's Daily Diary November 1, 1969 – November 15, 1969" (PDF). Nixon Library. July 2, 2013. Retrieved April 17, 2017. ^ AmericaLive (November 22, 2010). 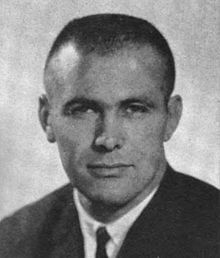 "Donald Rumsfeld Biography - CNN iReport". Ireport.cnn.com. Retrieved April 17, 2017. 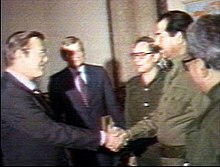 ^ "Rumsfeld to personally sign all condolence letters". Stars and Stripes. Retrieved October 20, 2017. ^ Hern, Alex (January 25, 2016). 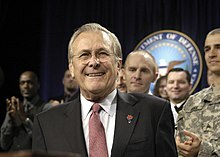 "Donald Rumsfeld releases solitaire app". The Guardian. Retrieved January 25, 2016. ^ "At 83, I Decided to Develop an App". January 24, 2016. Retrieved January 25, 2016. 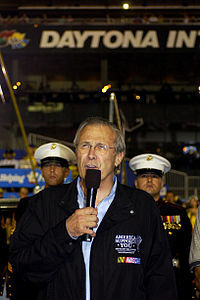 ^ "Former Defense Secretary Donald Rumsfeld Just Released a Video Game". GameSpot. January 25, 2016. Retrieved February 8, 2016. ^ "Berry gets worst actress Razzie". BBC News. 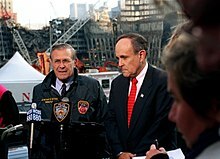 February 27, 2005. Retrieved January 27, 2016.